This was truly a colorful cooking experience. 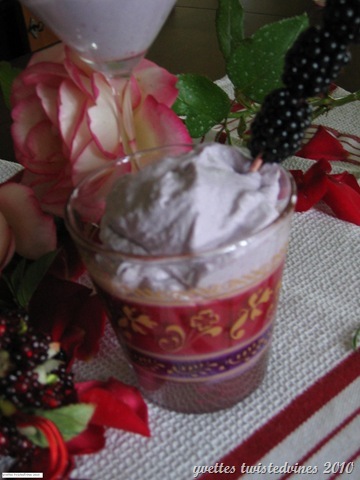 This cream is made with fresh mulberries, a little messy, but hey all in the fun of cooking. Mulberries are in season at the moment,from May until September, a dark grape nearly black colour, shiny, with a mixed taste of sweet and sour flavour, wonderful for making jams, jellies and ice –creams. Always best to eat this fruit straight away as they’re hard to conserve. There are many wild mulberry trees along the walkways around our place and our street at the moment is stained a dark violet colour. We have four large mulberry trees along the side of our house, planted nearly fifty plus years ago, they were planted to divide not only the vineyard, but used in silkworm farming. Wash and pat dry mulberries. Pass through sifter collecting the juice. 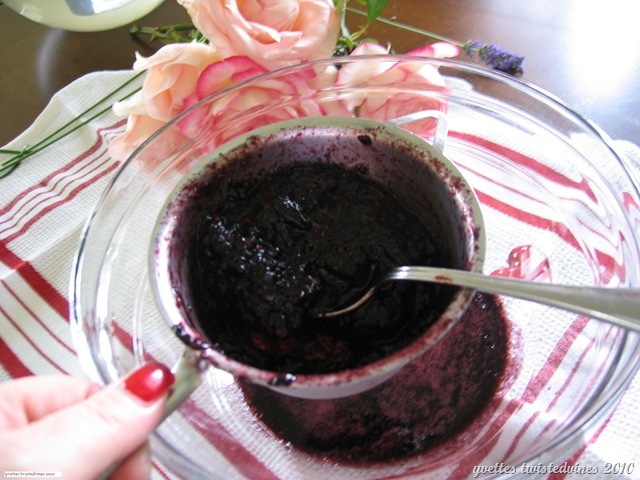 To the mulberry juice add sugar, liqueur and mascarpone, mix until creamy. 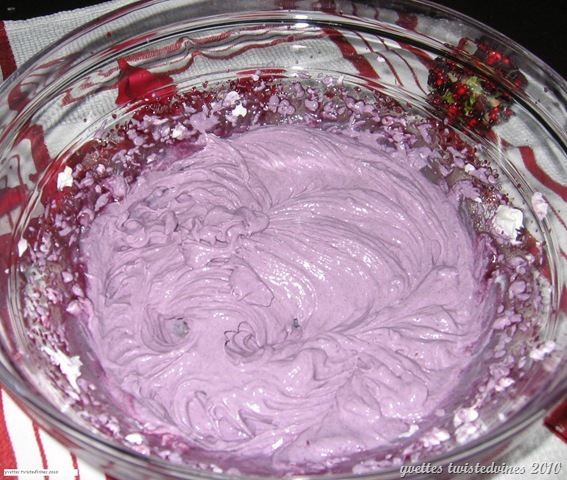 It creates a wonderful lilac, violet colour. 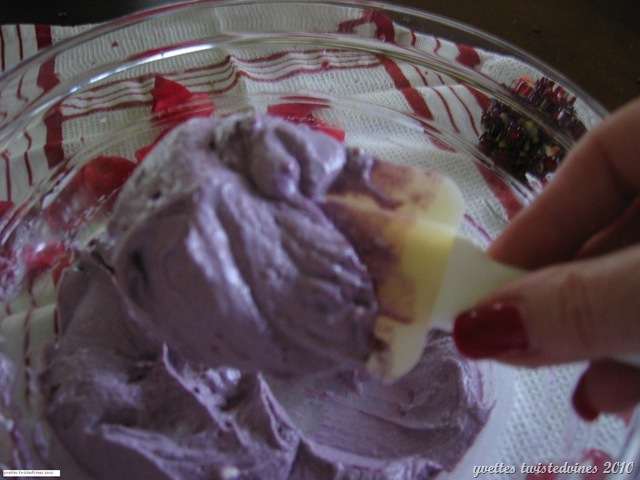 Beat the cream until soft peaks form, delicately add to the mulberry cream. 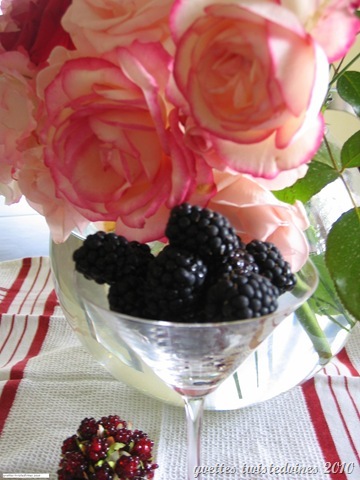 Serve in glasses, and garnish how you wish…I used mulberries and mint leaves. A great Summer treat. Enjoy! Your dessert looks heavenly! I have never eaten a mulberry so I will have to see if we can grow such a thing in this part of world. We have vineyards galore here, so maybe we have those too…thanks for sharing! This recipe is a delight, a summer blast of colour! Look at that colour! It looks glorious! It is so pretty that i don’t feel like disturbing it’s shape. very nice…..